RevK®'s rants: When does the taste not matter? 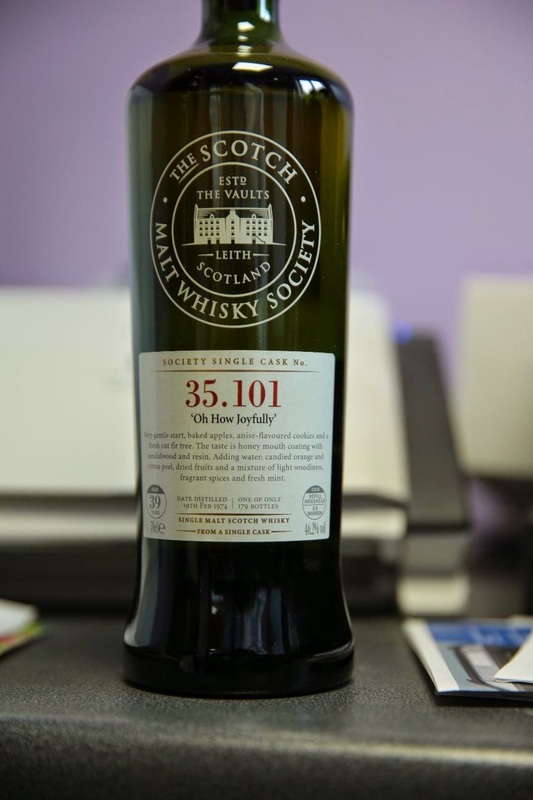 I have some nice whisky from the Scottish Malt Whisky Society. I am actually quite pleased that I joined - previously whisky did not hold much appeal - it was always a bit rough and after a few shots you started not to notice. Then I was given a bottle of G7.4 which was, well, just really really nice. I have tried several of their whiskies since. I don't like the peaty once, and prefer those that are slightly sweeter. These are not cheap bottles, but they last a while and are quite strong (sometimes up to 60% ABV). I got some bottles for various friends once I joined, and I am told by Simon that we spoiled him and his dad for drinking normal whisky for weeks. I was however making the joke that someone told me about not drinking any whisky aged less that you are yourself, and realised that a 50+ aged whisky would be pretty rare and expensive. Someone pointed out Glenfiddich Glenfiddich 50 Year Old at a mere £19,995.00 (plus £5.95 shipping). Now clearly that is crazy. The problem is, at that price, it is £10 per 25ml shot of whisky FFS! OK, I am pretty sure I have been in bars that charge nearly that before, but still, this is an expensive bottle. But you have to wonder - at what point is it simply too expensive to drink. A £20k bottle clearly is never expected to be opened. At that price, it could be vinegar for all you know as nobody will ever be able to afford to try it, or to risk that having tried it they did not like it! My old boss told me he was once in a hotel whose bar was apparently famous for the variety of whiskies available. He ordered one, and the bartender said something like "good choice, sir" .. then he read the little sign on the table, boasting of the extensive and expensive range, going up to many hundreds of pounds for a single serving. He then had a rather nervous meal awaiting the bill to see how expensive something was to qualify as a "good choice" ... I have a feeling it turned out to be around the £10 mark for that glass, a great relief compared to what the damage could have been! I drink single malts, but not at those sorts of prices. Glenmorangie, Bushmills single malt, and Isle of Jura are probably my favourites. All can be had for under £30 a bottle. I do however agree with Alex. Friday is always a good enough reason to open a bottle. The crazy thing is that people buy 20ml bottles of 'rescue remedy' (aka brandy - theoretically it has other ingredients, but only if you believe in homeopathy) for £10. Which makes it more expensive than your whisky, but I bet it's not aged for 39 years! I found the trip I took to the Glenfiddich distillery near Dufftown highly entertaining. Not my first time in a malt whisky distillery, but much more impressive than the still very good Glengoyne. There we got to sample several ages of their single malt - 12, 15, 18, 21 and 30 years - the 12 in both plain and peaty versions. We also got a chance to nose some unmatured spirit. I bought a 200ml bottle of the 21 year old - it remains unopened as yet. I was planning to save this for a special occasion - unless it's a certain person's emigration, I don't know what it will be. I've never been much of a Whisky person, I don't normally drink at all (I prefer to be able to drive) so when I do have something I prefer sweeter drinks like Schnapps or Amaretto. I recommend Edradour. It's the smallest distillery in Scotland, which makes the tour a little different to some of the other places. It only takes two people to make the stuff. It's quite reasonably priced and the cream is just heavenly.